February Job Losses: Have We Reached Bottom Yet? Using the U.S. government's count, about 2.4 million Americans lost their jobs last year. That does not include people who had been jobless for an extended period and were no longer looking for jobs. In January, another 598,000 people were put onto the streets by their employers, moving the unemployment rate up to 7.6%. Analysts may admit to a frightening February unemployment rate, but most either believe that the economy is going to get better or don't want to say in public what they think. While it is comforting to claim that the February numbers will be a high-water mark for employment erosion, that may not be the case. The joblessness rate could thunder higher between now and the year's end. During the 1980-82 recession, unemployment went from 7.9% in October 1981 to 10.1% the following September. Two months later, it hit 10.8%. The notion that 10% unemployment will not arrive until next year, if it comes at all, is bogus. The proposition that the stimulus package and new budget will create jobs may be true. It is also true that not enough money will reach companies to have much impact on their hiring this year. No one knows whether the programs will work. Since they are untested, particularly in an economy this large that is destroying itself this fast, trying to assess their chances of success is as tough as making a winning wager on which dog team will win the Iditarod. 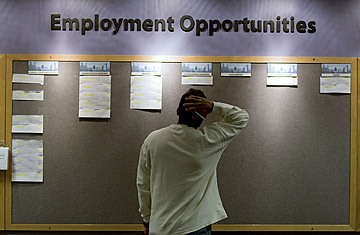 The monthly average increase in unemployment this year could be 650,000 to 700,000 jobs. Between the end of last year and next January, 8 million people could be put out of work. The fact that the number is staggering does not make it improbable. The government's plan to create jobs is not set up to cope with a situation in which jobs are lost at a rate of 2 million per quarter. Even advocates of tax cuts would have to admit that the money any cuts would add to business and consumer wallets would not make much difference in the next several months. That may be academic. The Administration is proposing a modest cut for most people, but it is just that  a modest cut. Businesses that will be taxed at a higher rate will have to decide whether that drain affects how many people they'll have on their payrolls. The market may have to go through the tragedy of a self-correction that combines agony and duration. The economy may run through a cycle in which unemployment increases until labor costs fall to a nearly unimaginable level. Businesses will begin to hire again because they will have access to skilled workers at a fraction of what those people would have cost them a year ago. If that is the solution to the labor problem, the end of the recession is a long way from here. See 25 people to blame for the financial crisis.